The Building Energy blog is your source for energy news in Vermont. Read through a collection of energy articles on a variety of topics such as energy efficiency, solar power, weatherization, insulation, heat pumps and construction. With over thirty-five years of experience in the energy industry, Building Energy is your source for energy news, facts and information. The Building Energy team was excellent. If they saw something that needed attention they addressed it properly and efficiently. I had them do some other work that was not part of the energy efficiency scope and was very impressed with the person who performed that work as well. From the people in the office to the people in the field, I found this company to be a high quality operation. I would highly recommend Building Energy. Way to go Chris Charuk , Brian Tucker and our Insulation Team! The Building Energy Team will be in attendance. Come meet one of the most respected Solar and Efficiency Teams in Vermont. Efficiency Vermont and Renewable Energy Vermont (REV) will be hosting a Clean Energy Workforce Legislative Reception at the Vermont Statehouse on Tuesday, March 12. This event will showcase all of our partners who make clean and efficient energy a reality in Vermont, and allow for these partners to connect with their local legislators. There will be displays of recent clean energy and energy efficiency projects and technologies, casual conversation, and food and beverages. REV will also be holding their annual meeting and a skills training prior to this reception and all EEN members are invited to attend. Building Energy has been using Demilec Spray Foam in all our customers homes! Call Building Energy today to discuss the benefits of having a home audit done and the proper use of spray foam. 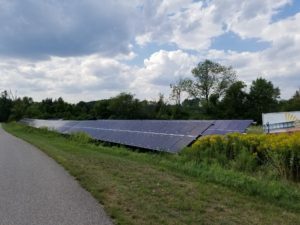 Building Energy is excited to announce the completion of our most recent addition to the Krag Solar Farm in Shelburne, Vermont. The Krag’s are true solar believers, as they started out with a 7 KW roof-mounted solar array on their home in 2014. They then had us install a 60KW solar farm system in their meadow in 2015. The newest project is a 15KW addition to their meadow solar array. The Krag’s are now 100% solar powered for their home and farm! Let the sunshine! Proudly designed and installed by a Vermont owned and operated the company. 3.12 kW DC PV solar system installed on a residential building in Cornwall, Vermont in January of 2017. 5.94 kW DC PV solar system installed on a residential building in Fairfax, Vermont in December of 2017. 6.33 kW DC PV solar system installed on a residential building in Ferrisburgh, Vermont in December of 2017. View details & learn more about our solar energy services! 6.33 kW DC PV solar system installed on a residential building in Fairfax, Vermont in October of 2017. This is a very typical solar panel installation for a house in Vermont. It will cover all the amount of this family’s electric consumption. This system is under manufacturer warranty for 25 years and will probably last much longer. This is something every household in Vermont should have on their roof. The client is very happy with the system and is saving big by going green!